>> What Is The Cost Of Paintball? The cost of paintball will depend on how much or how little you want to play and pay. The more time you spend playing the sport, the more money it will cost you in the long-run. Here’s our guide if you're wondering how much is paintball going to cost. The cost of paintball will be determined by the field provider. In most cases, a game will cost between $20 to $140 per person. The total cost will depend largely on the field you choose and if you are renting paintball gear. Don’t want to spend too much money? Give the field a call to ask about the field, rental equipment and air refill options on-site. It also never hurts to ask if they have any discounts for first-time players. Sometimes it pays to be a little cheeky, right? It is possible to bring your personal paintball equipment with you. Don't be surprised, however, if a provider insists you only use their field paint. Are you wondering "how much will the field paintballs cost?" It often costs between $35 to $60 per box for 2,000. Many beginners tend to use more paintballs when starting out - expect to use up to 600 paintballs on your first day. How Much Will It Cost to Buy Basic Equipment? It's important not to splash the cash too hard when you start playing paintball. A beginner's semi-automatic or electro-mechanical paintball gun will cost between $70 to $100. If you think you will fall head over heels in love with the sport, select an upgradeable entry-level paintball gun. If paintball turns into a passion, you'll be able to add barrels, expansion chambers, drop forwards and more. If you don't want to spend much initially, we recommend choosing a pump rifle. Yet, they can be a little slower in comparison to other paintball guns. They also lack the accuracy you might want when on the field. In some cases, the guns will come equipped with a mask, hopper, and tank. You do have the option to buy the items individually. While a hopper will cost you as little as $5, you could pay up to $20 for a mask. Try not to compromise on quality when it comes to a mask. It's essential you protect your face as much as possible during the sport. Never remove your mask on the field, even if it fogs up, as it can be a dangerous sport without the right headgear. You'll be wearing your mask for a long time, so invest in a comfortable option. Will There be Any Recurring Costs? If you do decide that paintball is the sport for you, it might be wise to buy or upgrade your own equipment. As well as paying a fee to use a paintball field, you will also have to pay for both air and the paintballs. You can buy the items in bulk, which will come in count boxes of up to 2,000. You can choose between .50 and .68 caliber rounds. You will also need to buy air canisters along with the paintballs. Without the canisters, you won't have any fuel to fire the paintballs at your opponent. You can go traditional with CO2 air canisters, or you can choose compressed air. Many people choose compressed air because it is more environmentally-friendly. The cost of the canisters will vary depending on the option you choose and the supplier. How Do I Find High-Quality Paintballs? There are certain ways you can check if you're investing in high-quality paintballs. A spherical, thin paintball shell is a sign of a high-quality round, as it will burst easily on impact. You should also consider the thickness and brightness of the paint. The last thing you will want is for a player to be able to remove any signs of a hit. Can I Pay for Rental Equipment? You don't have to spend a small fortune to paintball. If you're a beginner and want to try the sport, you'll be happy to learn most local fields offer rental equipment. The price will depend on the field, but we wouldn't expect you to pay any more than $30. The average paintball price will be for an entry-level gun, mask, tank, hopper and paintballs. Some may even include the entrance fee in the rental equipment price. 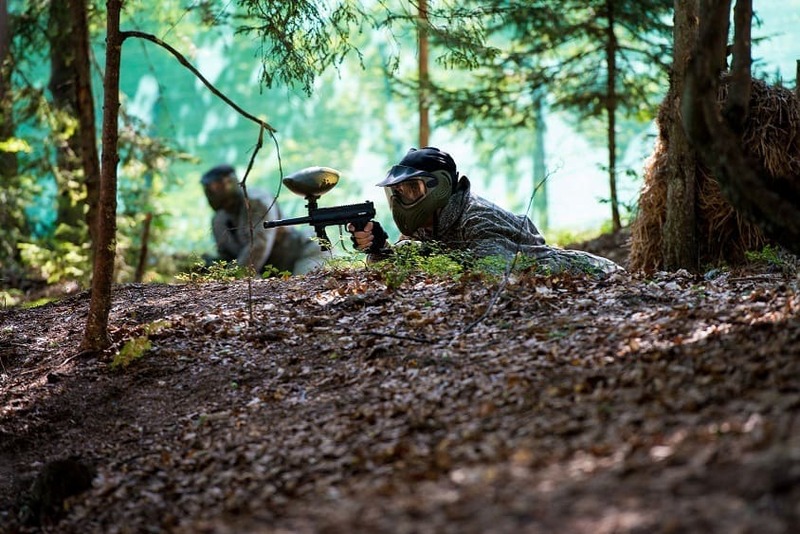 You can also look for paintball stores that will allow you to rent their equipment to play anywhere. By doing so you could buy your own paintballs, which could be cheaper than the field paint. The sport is often played on either a course or field that's designed for that purpose. You can often reserve a paintball spot on a per person rate. Yet, some fields may provide packaged deals to choose from. It is also possible to play at an amazing secluded location, or you could even play a free game on your own property. Are Package Deals Worth the Money? The last thing you will want to do is spend an arm and a leg on a sport you don't enjoy. Packaged deals can be a great way to try out the sport for the first time. The deal will include the cost of the equipment, field fee, air, and paintballs. Don't expect to use the latest paintball equipment though. More than likely, the rental equipment will be outdated, but they'll still be effective. The cost of paintball can be as high or low as you allow it to be. If you're wondering "how much will it set me back?" you should ask yourself how much you want to pay and play. Never buy equipment before your first try, because you might not enjoy the game. Rental equipment might be a little lower on quality, but it's a great way to enjoy a test run. If you enjoy the experience, you should be ready to invest in entry-level equipment. Your paintball gear should grow alongside your experience. When the time comes to upgrade, you won't be thinking "how much will it cost me" and will see it as an investment in the sport. Do you have any paintball tips for beginners? Write a comment below to share your advice.